Head over to B&H Photo now where you can find a tremendous Black Friday camera deal on the Canon EOS SL2 (EOS 200D), down from $898.99 (£700) to $549.00 (£428) – a saving of $349.99 (£273). Not only do you get a great first DSLR, but you can unleash your creativity with dual bundled lenses. 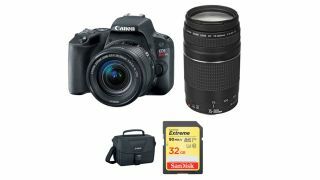 The Canon EOS Rebel SL2 is a DSLR with a difference. While it retains the full advantages of the reflex mirror, it features a miniature design, exhibiting proportions and weight more commonly expected from a Compact System mirrorless Camera (CSC). This makes the SLR a perfect camera for travel and when you want to remain unnoticed, for shooting in a fascinating street environment. Don't let its small size fool you though – the EOS Rebel SL2 comes packed with all of the features we've come to love from an entry-level Canon camera. You get a 24MP high resolution sensor for stunning image detail, a 63-zone dual metering system for exposure accuracy and an advanced image processor for natural-yet-punchy colour. You also get the benefit of a Clear View II touch screen LCD, built-in wifi and internal creative filters. Meanwhile, the Canon EF 75-300mm lens offers the ideal entry into the world of telephoto photography, allowing you to capture far-off subjects with precision and ease. With such creative freedom you'll no doubt be shooting a lot of photos, so it's lucky that with this deal you also get a Sandisk Extreme 32GB SD card thrown in! Then to top it off you can carry your gear in the included Canon EOS Shoulder Bag 100ES. You'd be mad to miss out on this short term offer from B&H. Get yours now and start your Canon DSLR photographic journey!